Richmond, VA – Bag Boy is excited to announce the release of the all new Nitron™ Push Cart, a revolutionary auto open cart engineered with Nitro Piston Technology, transforming from a compact folded cart to open and ready to go in seconds. Bag Boy has come a long way since the invention of the original walking cart back in 1946 and their technology gains new ground with the Nitron™ Push Cart. 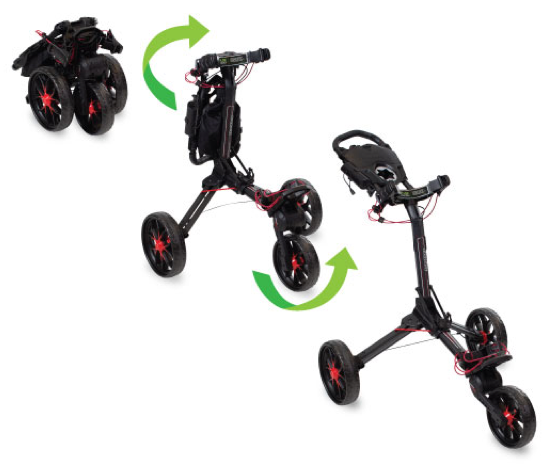 The nitrogen powered auto open creates a simple two-step open making opening the cart effortless as the front wheel automatically pops out into place. Folding the Nitron™ is also a simple two-step process, folding in seconds to a compact size, ready to be stored. The Nitron™ Push Cart launches at the annual PGA Merchandise Show January 22-25, 2019 in Orlando, Florida. Suggested retail is $249.95 and will be available in 8 colorways, starting April 25th. Established in 2004, Dynamic Brands is the parent company for a portfolio of premium brands committed to the development of innovative, high-quality products supported by outstanding customer service in the sporting goods industry. Golf and recreational products are offered through Bag Boy, Burton, Datrek Golf, Devant Sport Towels, IGOTCHA, Riksha, SEARCH ‘N RESCUE and FLAGPOLE-TO-GO brands, and include walking carts, golf bags, travel covers, custom sport towels, bag tags, golf ball retrievers, flags and accessories. Dynamic Brands’ products are marketed in 87 countries worldwide. For more information, please visit www.dynamicbrands.com. For more information, please visit www.dynamicbrands.com. Follow us at https://www.facebook.com/dynamicbrandsrva/ and https://www.linkedin.com/company/dynamic-brands/.